We arrived in Oxford via train yesterday a bit before 2:00 PM. It was one of those infamous ‘partly sunny’ British days where one minute it’s sunny out and the next it’s spitting bits of snow. I used to think the weather in Oklahoma was unpredictable and changing rapidly; while still true, England’s weather pendulum swings even farther. A short walk from the train station brought us to a small pub on the western edge of town center, and we settled down. As there were about four hours to kill before we ventured out to our host’s home, it provided plenty of time to walk about some of the most famous learning institutions in the world. Indi stuck to the tavern to read (and watch our bags) while I wandered the streets. The aforementioned unpredictable weather patterns made me quite thankful for my Travelin’ Hat and the protection it provided from the elements. The streets of Oxford are trafficked by more than just bus and car. I’ve seen more bicycles here than I’ve seen since leaving Japan. Most students (of which there are many) use ‘em to get from A to B and the city is built to accommodate the herds of bikers. There are many little pedestrian avenues as well. Tucked in and around these streets and shops are a seemingly infinite number of colleges, universities, and museums. What looks like a grand cathedral in the distance ends up being a grand campus centerpiece. It feels like living in another time. 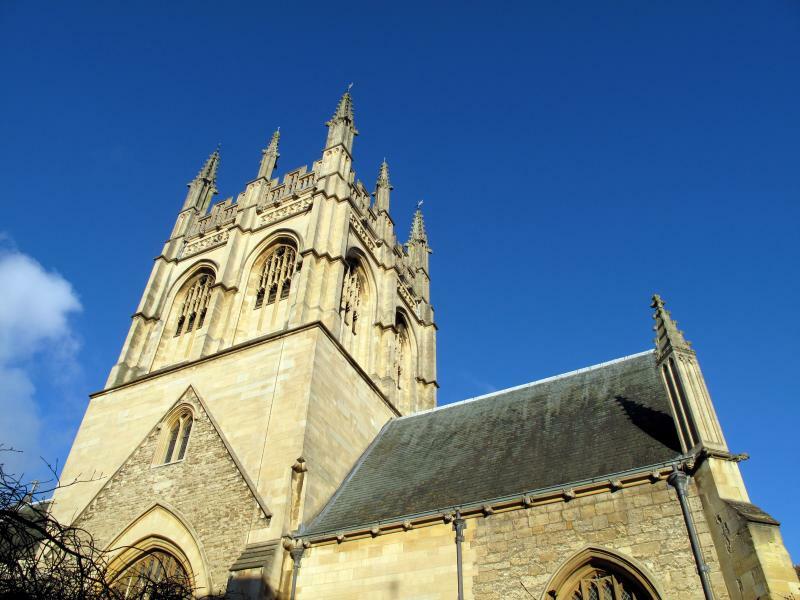 I saw Christ Church, Oxford University, Pembroke College, Oriel College, Corpus Christi, Hertford College, The Queen’s College, Magdalen College, New College, and others that aren’t on my handy tourist map. 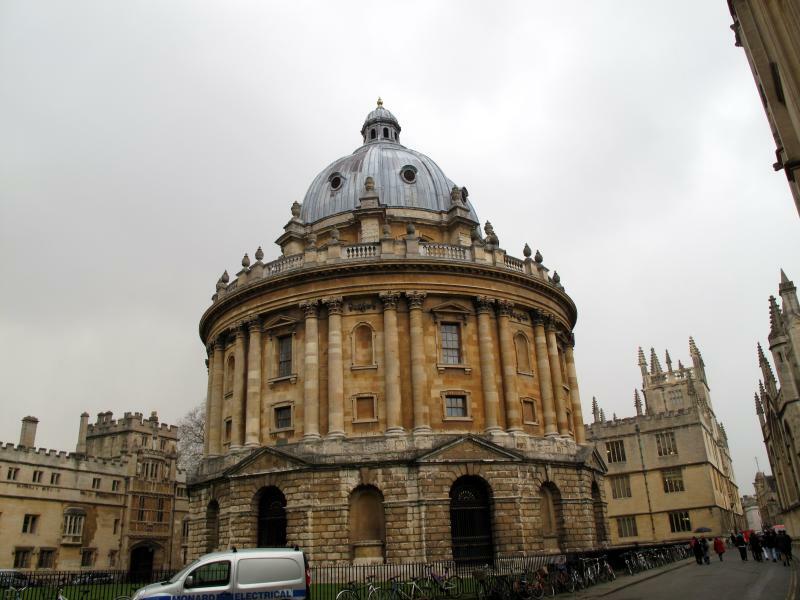 I walked around the Radcliffe Camera (odd name for a rotunda), the Bodleian Library, the Sheldonian Theatre, The Church of St Mary the Virgin, Carfax Tower, Oxford Castle, and down Dead Man’s Walk. This was all in the span of about an hour and a half. Oxford is an extremely dense city. The random precipitation sidelined me in doorways and under awnings as I walked. It seemed like every building spoke of ageless wisdom and untold numbers of intellectual conversations held within its walls. I felt tiny. As six o’clock approached, we boarded a bus to the suburb of Headington and met up with Mike and Helen Brewin, parents of the wonderful Emma whom we Couch Surfed with in Bangkok. (Boy, that feels like FOREVER ago.) Mr. and Mrs. Brewin were fantastic hosts and were the quintessential English mum and dad. They gave us a warm bed, a tasty lasagna dinner, and regaled us with tales of their own worldwide journey just a few months ago. 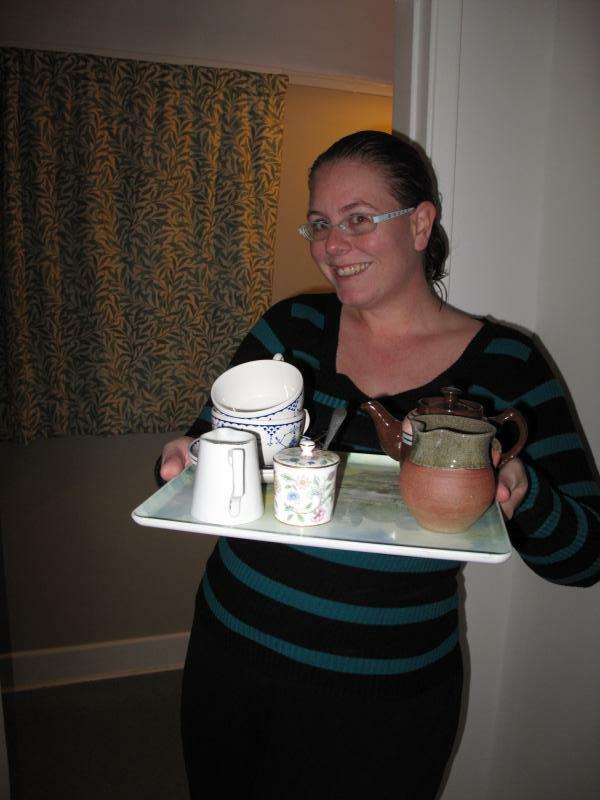 Oh, and when they offered us tea, Mrs. Brewin brought it on an actual tea tray! Amazing. When Indi and I awoke this morning and took our breakfast, they gave us a map and pointed out some places we absolutely must see before catching the train back to London. They were splendid people and we are lucky to have spent some time with them! Now I’m writing this blog, sitting in Georgina’s Coffee Shop in a covered market in the center of Oxford. Indi is out touring the Ashmolean Museum and a visiting Steampunk exhibition at the History of Science Museum. In a few hours, we board the trains for the last time and will arrive at our last destination before our final flight on the 18th and land at O’Hare International in Chicago. It’s hard to believe home is almost here.